I think most people agree that it does matter what you eat when seeking weight loss, fat loss or increased sports performance. Vitamins play a crucial part in that process. Can you lose weight by ignoring what you eat and simply focusing on calories? Yes you can, many people have proven that. That does not mean though that you cannot optimize your goal achievement by paying attention to the detail. Do you have all your vitamins? 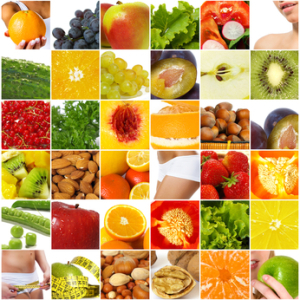 Vitamins are an organic compound that only exists in small amounts in the body. They play roles in growth, energy transfer, nervous system function, and most importantly as co-enzymes, which means they provide the non-protein part of the enzyme. Enzymes are catalysts and they highly accelerate or enable metabolic functions. If you have a lack or overabundance of a certain vitamin (the latter due to unnecessary supplementation) certain functions of your body won’t work as efficiently anymore, or have deficiencies in some areas. You cannot build up new protein structures well, you have a delay in recovery from exercise and stress, part of the energy metabolism does not work properly, and many more issues. Vitamin B5 (Pantothenic Acid) for example is responsible for the formation of acetyl-CoA which is part of the energy chain. Supplemented vitamins may be taken up differently from vitamins contained in food and may be less effective. Excessive vitamin supplementation intake may have negative health consequences, including cancer. Eat a diverse diet of whole, unprocessed foods including dark, leafy, green vegetables, mushrooms, colorful fruits, grass-fed meats, poultry, fish, etc. Focus on foods that are naturally rich in vitamins. I personally avoid enriched foods and concentrate on having a wide variety of natural, whole foods that provide me with the vitamins I need. Due to my heavy training schedule (10+ h/wk) I supplement with a multivitamin once a day but monitor closely for signs of toxicity, etc. There are people who will tell you that foods nowadays do not contain vitamins anymore and that you need to supplement. This is simply not true. Choosing seasonal foods from your local farmer increases your chance of having vegetables & fruits that ripened longer and are richer in vitamins, minerals and phytonutrients.